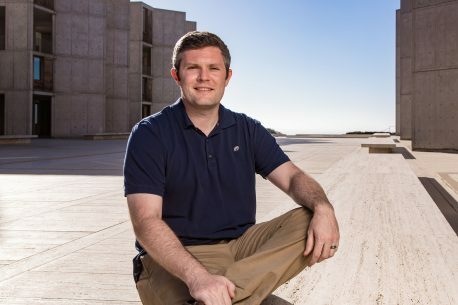 LA JOLLA—Cancer cells often have mutations in their DNA that can give scientists clues about how the cancer started or which treatment may be most effective. Finding these mutations can be difficult, but a new method may offer more complete, comprehensive results. A team of researchers has developed a new framework that can combine three existing methods of finding these large mutations—called structural variants—into a single, more complete picture. The new method—published in Nature Genetics on September 10, 2018—could help researchers find new structural variations within cancer cell DNA and learn more about how those cancers begin. 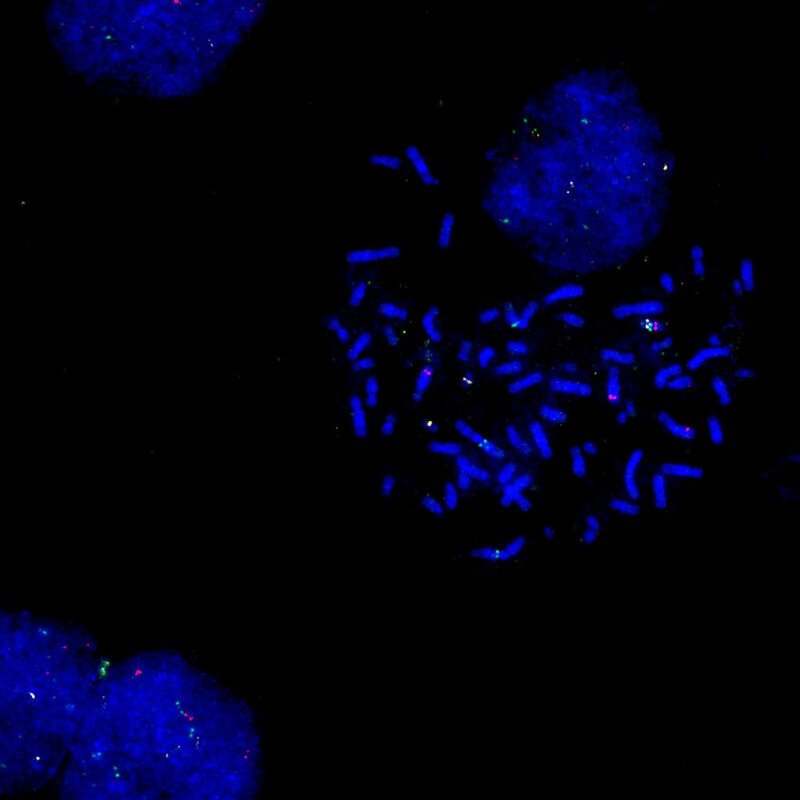 Fluorescence microscopy image of DNA (blue) from a cancer cell showing a complex structural variant (chromosome shown at upper right with cluster of colored dots) identified by the new integrative profiling method. What the researchers observed is that some structural variants appear to affect regulatory gene “switches” in noncoding sequences of DNA. Defective switches prevent appropriate turning on or off specific genes and this can contribute to cancer. They also used the Hi-C method to explore how structural variations can affect 3D genome structure—how DNA folds itself within the cell. “Cells are small, but their DNA is very long—laid out in a line, all the DNA from one cell would be more than two meters long,” says Job Dekker, professor and co-director of the program in Systems Biology at University of Massachusetts, investigator of the Howard Hughes Medical Institute and a corresponding author of the paper. “That’s why DNA needs to fold in intricate ways. We have found that genomic alterations in cancer cells can lead to differences in how the genome folds and this can lead to cases where genes become turned on or off by the wrong regulatory switches”. The National Institute of Health, Howard Hughes Medical Institute, European Research Council, Cancer Research UK, Wellcome Trust helped support this work. Other authors included: Jie Xu, Fan Song, Yanli Wang, Lijun Zhang, Hongbo Yang, Tingting Liu, Sriranga Iyyanki, Lin An, James R. Broach and Ross C. Hardison of Pennsylvania State University; Vishnu Dileep, Takayo Sasaki, Juan Carlos Rivera-Mulia and David M. Gilbert of Florida State University; Ye Zhan, Hakan Ozadam, Bryan R. Lajoie and Job Dekker of University of Massachusetts; Victoria T. Le of Salk; Galip Gürkan Yardimci and William Stafford Noble of University of Washington; Abhijit Chakraborty and Ferhat Ay of La Jolla Institute for Allergy and Immunology; Darrin V. Bann and Christopher Pool of Milton S. Hershey Medical Center; Royden Clark of Penn State College of Medicine; Rajinder Kaul, Michael Buckley, Kristen Lee, Morgan Diegel and John A. Stamatoyannopoulos of Altius Institute for Biomedical Sciences; Dubravka Pezic and Suzana Hadjur of University College London; and Christina Ernst and Duncan T. Odom of Cambridge University. This release is based on materials provided by the Pennsylvania State University.